DH Electronics presented another Solder-on module (SOM) which can be soldered on a carrier board. Direct soldering of the DHCOR increases operational reliability in harsh environments and saves board-to-board connectors. With an unchanged footprint of 29 mm² x 29 mm², the DHCOR STM32MP15x module can be equipped with processors from the STM32MP1 family. 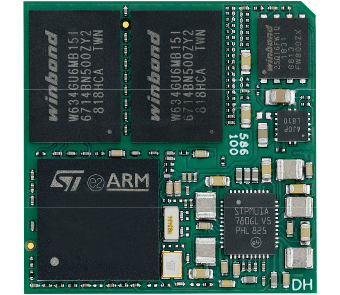 These hybrid multi-processors combine the Cortex-M4 processor 200 MHz with one or two Cortex-A7 cores 650 MHz, and optionally a special hardware crypto unit and/or a Vivante 3D GPU with HD resolution of 533 MHz. In addition, up to 1 GiB DDR3 memory, Power Management IC (PMIC), and 2 MiB SPI boot flash can be accommodated on the module. This gives the STM32 community a way to extend their embedded micro-controller projects software-compatible with scalable, Linux- and Ethernet-capable hardware. If required, an optional 3D-GPU and/or a hardware crypto unit can be added, too. Everything is scalable and comes pre-integrated with suitable Linux BSPs. So Internet-of-Things (IoT) developers have Linux access to the STM32 ecosystem and its embedded genes now. The analog peripherals include 2x 16 bit ADC, 2x 12 bit DAC, digital filter for Sigma Delta modulator with 8 channels/6 filters, as well as a temperature sensor and an internal voltage reference source. Up to 29 timer, counter or encoder inputs, three watchdogs and 176 I/O ports are also provided. The 37 communication interfaces enable connection to a range of interfaces, including TTCAN, CAN FD, and LIN. IoT and/or HMI applications from sensor and actuator to cloud can be realized with just one chip (the STM32MP1). On top, DH Electronics is developing another SOM with the STM32MP15 family using the SODIMM-200 form factor. This is 100% software compatible with the DHCOR solder-on module for the STM32MP1 family, so that it can be used as a development and reference system. The company offers for its DHCOM modules extensive accessories up to the complete, industrial Pico-ITX carrier board. Linux distributions Debian and Yocto are supported as operating systems.